The Blue Room Theatre’s latest offering is everything you’d expect from highbrow contemorary indie theatre: it’s a thoughtful, interrogative piece about isolation and loss; it’s a piece presented by some of the most promising names in the independent theatre scene; and, of course, it’s the kind of thing that makes you think long after it’s over. Oh, but with one key difference from the Blue Room’s usual offerings – Between Solar Systems is a spaceship-set sci-fi caper, that takes place 30 years after the demise of the world. A new play by prolific young playwright (and self-confessed Blade Runner fan), Scott McArdle, Between Solar Systems is McArdle’s attempt at showing that his genre is more than just strobe lights and naff effects. “I really want people who are sceptical about science fiction and fantasy to realise they have strong messages, they have heart,” McArdle told me when I interviewed him for Perth Guide. He explained that a sci-fi story is a vehicle for telling stories, in the same way other theatre is – and just because there’s futuristic technology and space-age settings, doesn’t mean a science fiction piece can’t have heart. And he’s hit home with Between Solar Systems. They play tells the story of Vincent, the sole survivor of a ruined, flooded Earth, who was launched into space 25 years previously to reach another life-sustaining planet and preserve the human race. Until he reaches that planet, he’s alone, with only the ship’s computer to keep him company – but, in true sci-fi style, he soon discovers that he might not be alone. Sure, there’s achingly impressive tech elements from AV designer Warwick Doddrell and a slick, sophisticated set by Sara Chirichilli – both of which serve to neatly sidestep Between Solar Systems from clunky science farce – but for all its enjoyably sleek technical elements, this is undoubtedly a story about loneliness, fear and truth – and the fact that it’s set on a spaceship could well be mere coincidence. Nick Maclaine, who we last saw at the Blue Room in Old Love, is Vincent. He’s onstage for almost every minute of the piece and he does a great job. He’s the straight man in banter with the silky, teasing Vi, the ship’s virtual intelligence system – wonderfully voiced by the inimitable Jo Morris. Where Maclaine is exasperated but restrained, commanding the stage with a stiffening of his shoulders or a quick turn out of the space, Morris is everywhere but nowhere, her almost-constant commentary both filling the physical void of the empty room, and tellingly, filling in the details of the early life Vincent can’t remember, in her methodical monitoring of his movements and health. 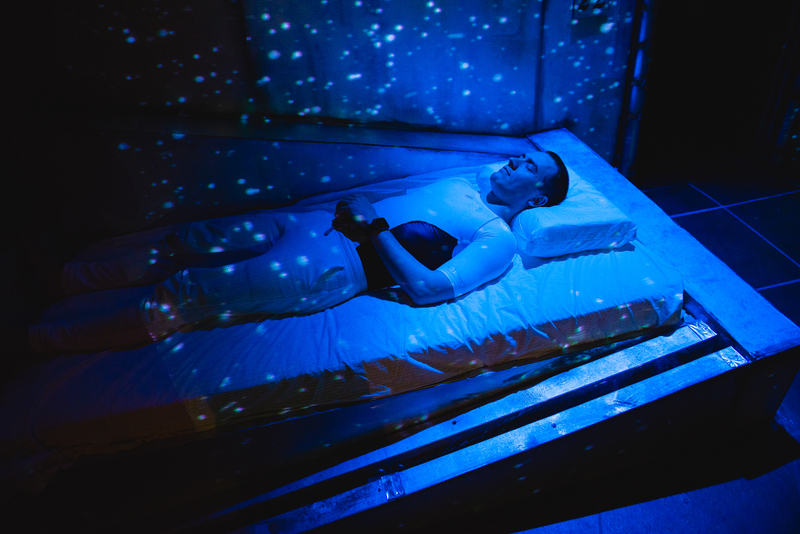 It’s wonderful watching as Vincent slowly starts to reflect on his life, and begin to question what he thinks is true – and though certainly the cool, white set, and the illuminated shipboard screen serve as reminder of the play’s futuristic setting, his anxiety and despair cut through to a very raw, personal place – in exactly the same was Maclaine’s angst over a greying hairline did in the opening moments of Old Love. Like Old Love‘s writer, Chris Isaacs, Scott is a master of dialogue. Between Solar Systems is a chatty piece, but it never feels overwhelming or burdened by the words. It’s intuitive and clever, and particularly with Maclain and Morris’ conversation, I only wanted more. That’s not to say it isn’t an excellent contribution by Emily David, the third actor in the piece. The youngest of the three, she more than holds her own in duet with Maclain, but I have to admit she really shines when she’s not trying to be Morris – call me biased, but I couldn’t get Morris’ Elvira from Black Swan’s Blithe Spirit out of my head when David writhed and simpered her way around stage as the intriguing, mysterious, simply named Woman. But she’s captivating in her final monologue – a heavy moment, which she teases out beautifully. It’s skillful and aching and quite surprisingly gentle – not a shade of Elvira spite. A word for Morris: incomparable. How lucky we are to have a talent like her in this state. Between Solar Systems is lovely. It’s a clever, entertaining, thought-provoking piece; absolutely a sci-fi story with heart. It’s playing at the Blue Room until September 26.